I call this an adjustment bento - one I use to balance out some not-so-healthy eating. Perhaps you’ve splurged at restaurant the night before, or polished off a whole carton of ice cream while watching a weepy movie. This bento is for days when you want to really want to watch your calories as well as eat a lot of vegetables. Call it dieting, detox, or what you will. It’s more interesting than a plain salad, and you won’t feel like you are depriving yourself. 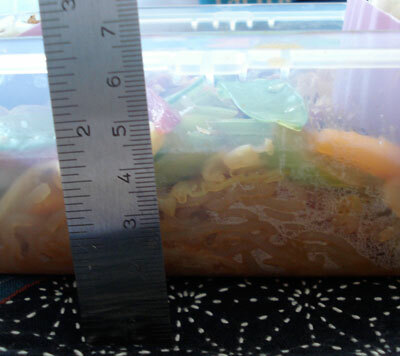 The key to this bento is to use as big a variety as you can of colorful vegetables for the noodles. Try to go for at least one from the deep green family, one from the light green family, and one from the bright red, yellow and orange family, and aim for at least 2 cups worth or more. It’s a good chance to clear out your vegetable bin too. 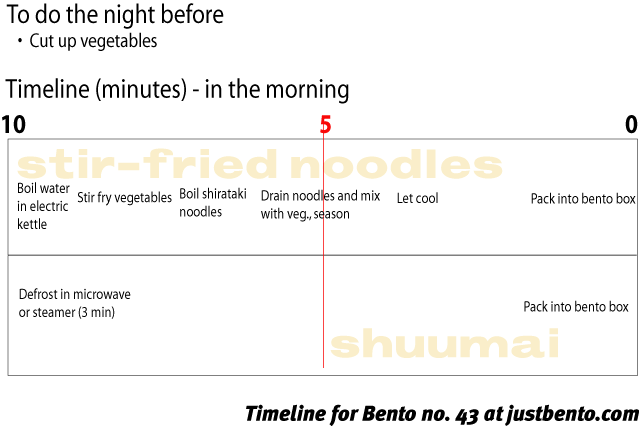 The noodles are almost-zero-calorie shirataki or konnyaku noodles, which are described in depth here . They are basically all water and fiber, and help to make you feel full. You can use a whole packet if you like, which will make you feel very, very full, or half a pack. The straw or enoki mushrooms also add fiber and texture while contributing almost no calories. For the protein part of the bento and for textural variety, I just microwaved some frozen shuumai dumplings . I used the vegan variety to keep this bento all-vegetable. If you use commercial frozen shuumai, calculate pork shuumai at around 60 calories per piece and shrimp shuumai at around 50 calories p.p. 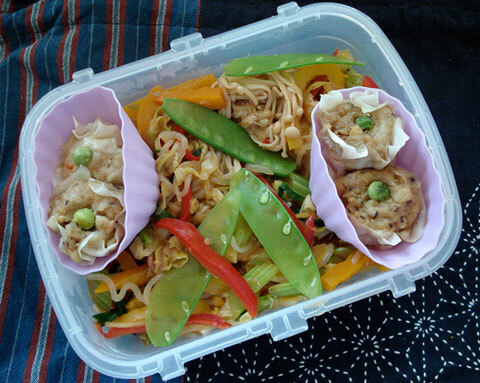 This is a variation on the Spicy Korean flavor noodles  in Bento no. 3. Heat up a wok or sauté pan. Add the sesame oil, ginger and half the green onions (the white and thicker parts). Add the vegetables and stir-fry. If the vegetables start sticking to the pan, add a tiny bit of water to loosen. Season with a little salt and pepper. With a very hot pan this should only take a few minutes. Add the noodles to the vegetables. Add the soy sauce and ketchup, and toss well. Turn out onto a plate and let cool before packing into bento box. I used a pretty deep bento box (more then 2 inches or 5 cm) for this. I felt very full after eating this bento, but very virtuous. If you can cut up the vegetables the night before, you can really cut down on the morning prep time. You can also make the noodle dish the night before.